This Mickey Newbury song is usually associated with country artists like Don Gibson, and even Roy Head has recorded it, but in the hands of George Brown it becomes a soul track of power and emotional weight. Brown's vocals are deep and dark, into Brook Benton territory, with the occasional high burst, and he gets a great deal out this waltz's heartbreak lyric. The simple arrangement only adds to the overall mood. It was cut at the famous Sugar Hill studio in Houston, TX. UPDATE ~ My great friend Greg Burgess has written with more info on George Brown. 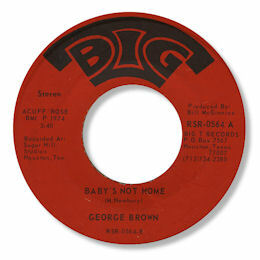 George was a member of the Texas version of the Soul Bros Inc and can be heard singing lead on their famous "Pyramid" 45 on Golden Eye as well as on "Love Sweet Love" on SBI. Note ~ "Baby's not home" can be found on the Soul From The Vaults CD "A Deep Dip Into Texas Soul". Thanks to Dave Porter for the suggestion and to Greg Burgess for the excellent Soul Bros Inc info.